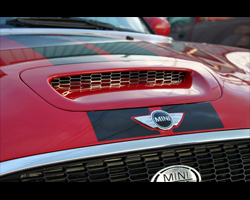 MINI FINI Hood Scoop Grill for 2007-2013 R55, R56, R57, R58, R59 MINI Cooper S. This intake scoop grill opens the grill to maximize fresh air intake on the turbo S model MINIs. The hood scoop grill allows more air in, thus keeping the engine compartment cooler and improving the efficiency of the cold air intake system. This also keeps the hood scoop cooler to try and keep it from warping. It installs in 5 minutes on the factory intake scoop. 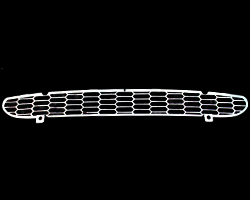 The hood scoop grills are laser cut from mirror finish stainless steel to keep it looking good for years. Great instructions included. Easy install.